WE R MEMORY KEEPERS-Envelope Punch Board. This is the easiest envelope maker on the market! Just punch and score. 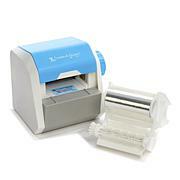 The 2-way envelope punch creates fold tabs and round corners. It is easy to create designer envelopes in dozens of sizes. Printed on the punch board are a variety of cards sizes, paper sizes, and the score lines. 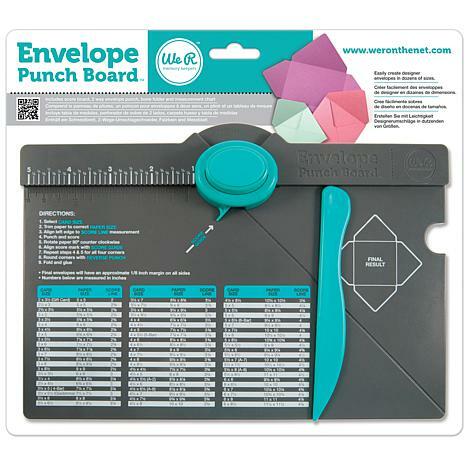 This package contains one 6-3/4x10-1/2 inch score board, 2- way envelope punch, bone folder and measurement chart. Imported. This is another great one for We R Memory Keepers. Easy to use, precise instructions and measurements are right on the tool plus a separate sheet. Makes envelopes for gift cards to larger items a snap when you are in a hurry. Quick way to make your envelopes with style and having fun at the same time. Best one I brought too. I love W R Memory products at a great price too. I saw this on TV and ordered it right away. I really enjoy making cards. Sometimes I need envelopes to match the card sizes. 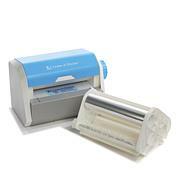 This is the perfect product to make your own custom envelopes. Think of all the colors and paper weights you can use! I've tried other envelope makers and found this to be the easiest to use; nice compact size for storage. Makes nice envelopes, however, many of my cards exceed the size of 6" x 8 1/2" size. I had no problem with the sizing chart. Remind me about We R Memory Keepers upcoming shows.